Absolutely the finest laptop stand you can buy! 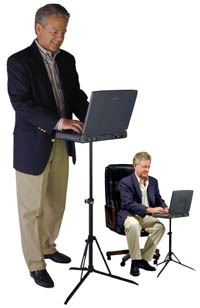 This taller version of the insTand lets you stand or sit at will. High-tech materials provide a stable platform free from wobbling or vibration. 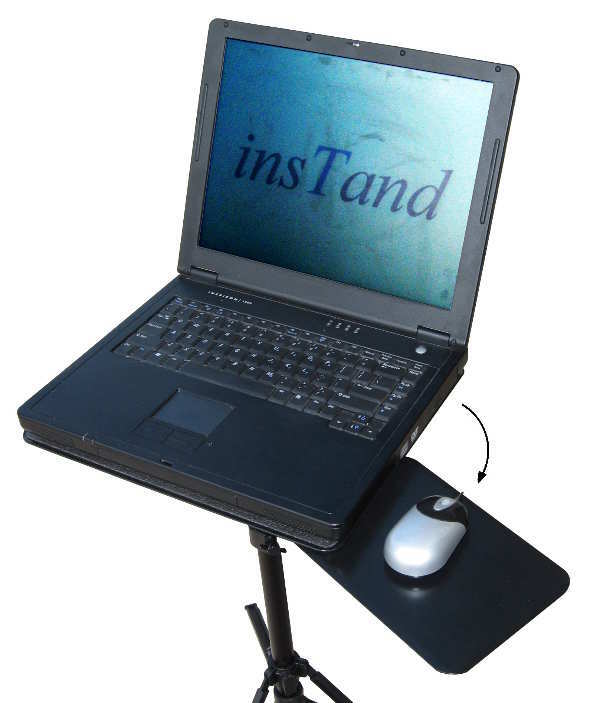 The non-skid 11" x 13" tray-top holds every size laptop and connects instantly and securely to the fully adjustable tripod. Features patented ergonomic tilt feature to adjust keyboard angle for comfort. Black anodized aircraft grade aluminum and composites. Model CR3 adjusts from 19" to 41" high. Durable construction - designed for years of daily use. Tripod folds really small - like a small umbrella. Fits in most laptop cases... folds to 2" x 18 1/2"
Ultra-light tripod weighs just 26 oz. Sturdy enough to support your laptop comfortably. Easily and quickly adjusted for maximum comfort. Includes tripod, standard 11" x 13" tray, and carry bag. INCLUDES - sturdy tripod with handy leatherette carry bag and 11 x 13 model CT4 tray-top. "...By the way, my insTand is FANTASTIC! I am a network consultant engineer and get called out to many places every day. None have convenient locations to place my laptop so I pull out my trusty insTand. I get so many comments, oohs, ahhs and more about it. Client engineers and staff see it and immediately ask where I got it..."
As used daily by thousands of Court Reporters!